Just to get things straight before we begin. The Woodstock you’ll discover on this screen is not the Woodstock of hippie folklore, where girls in flower crowns kissed boys in bell bottoms to the Greatest Hits of the 60s. No, this is another rural town, named one of New England’s ‘Most Beautiful’ – its streets dotted with cozy cafes, artisan shops and attractive architecture. Turn right from the hotel onto Killington Road. When you reach the stop sign, turn right again onto Route 4 East. Be careful of speeding in the area. Limits are strictly enforced in Bridgewater and Woodstock. 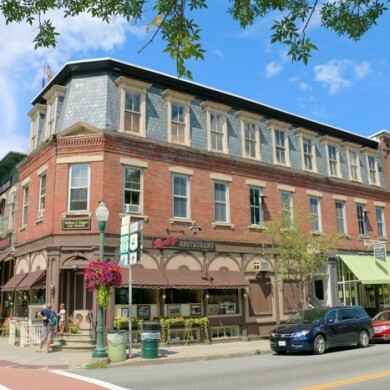 Woodstock is a quintessential Vermont town, with a walkable downtown perfect for strolling and shopping. It oozes historic charm – there’s not a bad street in the bunch. Lawns are exquisitely manicured, bursting with colorful wildflowers. You won’t spot a single power line; this is one of few places in the state where they’re buried underground. There’s an old-time pharmacy, an awesome toy store, and one of the most incredible smelling bakeries we’ve ever walked by (that’s saying a lot in these parts). Vermont Flannel is here, in addition to other stores offering men’s and women’s fashion, and jewelry, too. This 130-year-old general store is the oldest family-run store of its kind in Vermont. Times may have changed, but their motto hasn’t. It’s ‘your money’s worth or your money back.’ That goes for the many local offerings, from pure 100% Vermont maple syrup to cheddar cheese to sweets to hand-carved wooden figurines and gifts. We ate here on our way from Quechee to Woodstock. It’s open for breakfast and lunch, with a menu featuring salads, burgers, wraps and sandwiches, homemade cookies, muffins and pastries. There are only about 10 tables inside, with lovely outdoor seating on days when the weather is right. If you’ve planned a day of adventure, this is also a great place to ‘grab and go’ on your way. The eatery opens into a gorgeous market stocked with the essentials – a delicious deli, fresh produce and even a small hardware section. Stop here for an indoor rock climbing session with our friend and adventurer Steve Lulek. From Downtown Woodstock, Billings Farm and Museum is just a five-minute drive away. Visit the oldest working dairy farm in Vermont for historical reenactments and daily cow milkings. The farm is also home to wonderful community events, like those for the 4th of July and Christmas. You can read about our visit to Billings Farm here. Continuing down the road from Billings, on a bit of a winding, scenic gravel road, you can reach Sugarbush Farm in about 15 minutes. This working family farm is home to nature trails and a small petting zoo with miniature horses, goats, rabbits and chickens. Taste all the cheeses they produce, then watch them get packaged for sale. Sample four types of maple syrup, and head to the gift shop to try jellies, candies and sausages. You can also watch the syrup making process. Now that you’ve learned about some of our favorite places, we can’t wait to hear yours.